For many thousands of years, Jagadgurus had established their philosophies with only one teacher or devotee at hand. Knowledge was transmitted from person to person, but never in such large assembly as at Varanasi. There, Kripalu Maharaj propounded and reconciled the theory of the scriptures for all, pandits and young devotees alike. The event was so profound that all the learned pandits of Kashi Vidvat Parishad took the privilege of honoring Shree Maharajji with the flowers of their appreciation. 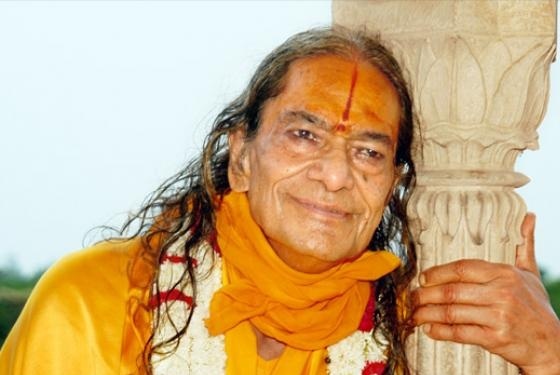 They considered themselves blessed with fortune to have heard his words, witnessed his Bhao, and worshipped him thenceforth as the Supreme Kripalu Maharaj of this age. Prior to him, only four Divine personalities have been given the title of Jagadguru. He is only the fifth Jagadguru to appear in 5,000 years. The Bliss he shares of nam sankirtan is the one and the same with that of Chaitanya Mahaprabhuji given five hundred years ago. Thus, Shree Majarahhi is also called Bhakti-yog-rasavatar: the descension of Radha Krishn love. Kripaluj Maharaj is the supreme acharya and Jagadguru of the present age. He accepts the philosophy of achintya-bhedabhed-vad, but is more specifically called sarv-siddhant-samanvai-ved which signifies “reconciled philosophy.” Shree Kripalujji harmonized all the prior acharyas that teach the path of selfless bhakti that serve one's path to realization of Divine love. His synthesis of the scriptures was completed with respect, full understanding, and humble deference to each of the past and ancient acharyas. Thus, Kripalu Maharaj did not write his own religion. The religion he has reformed is not separate from this past, for it is eternal. The path of selfless bhakti to Radha Krishn which itself is the same for all who wish to experience the unsurpassing supreme Divine Bliss of braj ras and nikunj ras of Golok and Divine Vrindaban. Thus, Kripalu Maharaj did not write a separate philosophy. He recognizes the Shat Sandarbh of Jeev Goswami and holds that the Bhagwatam is the complete and final scriptural authority on the Brahma Sutra. The lineage of Maharajji has been promoted by the rasik Saints who live on this earth planet. His lineage path was directly introduced into the world by Shree Raseshwari Radha Rani and Krishn during their period of descension.